The first day launch of Apple’s iPad has come and gone. We’ve seen videos of Apple stores opening yesterday, and heard stories of long lines of people just waiting for their chance to score a new iPad. But what about the actual first day iPad sales? From initial reports, first day iPad sales actually beat first day iPhone sales! John Boudreau covered the launch from Silicon Valley and reports, “Apple did not provide details of opening-day sales. But Piper Jaffray analyst Gene Munster, who had predicted that as many as 300,000 iPads would be sold this weekend,revised his numbers upward Saturday to between 600,000 and 700,000 units purchased on the first day.” The iPhone sold 270,000 units at its launch. Predictions for full-year iPad sales range from 5 million to 7 million globally, said Poynter.org. People right now are still a bit skeptical about the iPad. However, with yesterday’s first day sales looking to be stronger than expected and possibly even beating the iPhone’s first day sales, we could be looking at a new revolutionary device on our hands. 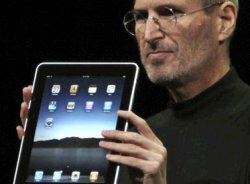 If you were to ask Steve Jobs, the iPad is actually “the most important thing he has ever worked on“. That’s a strong statement for Steve Jobs to say, and might indicate that the iPad is here to stay!